Royal Caribbean’s “Kids Sail Free” limited-time offer provides free cruise fare for third and fourth guests of all ages in triple or quad occupancy staterooms. Guests aboard the cruise line’s innovative ships will enjoy signature Royal Caribbean features and amenities, such as FlowRider surf simulators, ice skating rinks, rock-climbing walls and cutting-edge entertainment that are sure to WOW. The “Kids Sail Free” offer is available fleetwide, excluding Quantum of the Seas and Grandeur of the Seas. Third and fourth berth staterooms are limited on select sailings and the offer is only applicable while inventory last. Cruisers may book a balcony stateroom for the same price as an ocean view stateroom on Oasis of the Seas, Allure of the Seas, Freedom of the Seas, Liberty of the Seas, Independence of the Seas, Explorer of the Seas, Adventure of the Seas, Navigator of the Seas, Voyager of the Seas, Brilliance of the Seas, Jewel of Seas, Radiance of the Seas, and Serenade of the Seas, or an ocean view stateroom for the price of an interior stateroom on Enchantment of the Seas, Legend of the Seas, Rhapsody of the Seas, Splendour of the Seas, Vision of the Seas and Majesty of the Seas. Families and vacationers of all ages who book a Royal Caribbean cruise aboard these ships also will enjoy 50 percent-reduced deposit, starting at $50 per guest. Royal Caribbean International is an award-winning global cruise brand with a 45-year legacy of innovation and introducing industry “firsts” never before seen at sea. The cruise line features an expansive and unmatched array of features and amenities only found on Royal Caribbean including, jaw-dropping, Broadway-style entertainment and industry-acclaimed programming that appeals to families and adventurous vacationers alike. Owned by Royal Caribbean Cruises Ltd. (NYSE/OSE: RCL), the cruise line sails 21 of the world’s most innovative cruise ships to the most popular destinations in the Caribbean, Europe, Alaska, South America, the Far East, and Australia and New Zealand. World renowned for its friendly and engaging Gold Anchor Service, delivered by every staff and crew member, Royal Caribbean has been voted “Best Cruise Line Overall” for 11 consecutive years in the Travel Weekly Readers Choice Awards. For additional information or to make reservations, call your travel agent; visit RoyalCaribbean.com; or call (800) ROYAL-CARIBBEAN. 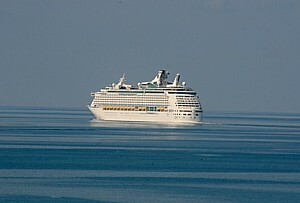 Follow on Facebook at Facebook.com/RoyalCaribbean or on Twitter @RoyalCaribbean. Royal Caribbean International has just unveiled its 2015 line-up of cruise vacations. In addition to Oasis of the Seas, Freedom of the Seas, Independence of the Seas, and Grandeur of the Seas. sailing in the Caribbean during the summer, cruisers will have a choice of three ships that sail from three convenient U.S. homeports to embark on breathtaking Canada and New England autumn vacations aboard Brilliance of the Seas, Serenade of the Seas and Grandeur of the Seas. Vacationers can now make bookings for these six ships for the 2015 summer and autumn seasons. Also Independence of the Seas will alternate seven-night Eastern and Western Caribbean vacations from Fort Lauderdale for its very first summer Caribbean season in 2015. Oasis of the Seas, which shares the title of the world’s largest and most innovative cruise ship with sister-ship Allure of the Seas, will continue a seventh year of offering round-trip, seven-night Eastern and Western Caribbean vacations from Fort Lauderdale, Fla., calling at some of the Caribbean’s most popular destinations. Ports of call include Nassau, The Bahamas; St. Thomas and St. Maarten on the Eastern Caribbean itinerary, and, on the Western Caribbean itinerary, Falmouth, Jamaica; Cozumel, Mexico; and Labadee, Royal Caribbean’s private beach paradise on the north coast of Haiti. Aboard Oasis of the Seas, guests will enjoy the widest array of onboard amenities in seven themed neighborhoods, such as an 82 foot-long zip line, a handcrafted carousel, the Rising Tide elevating bar, a fully-licensed Broadway musical, the high-diving AquaTheater, and Central Park with more than 12,000 live trees and plants, and many more. Oasis of the Seas also offers amenities that can only be found on Royal Caribbean, such as twin FlowRider surf simulators, cantilevered whirlpools, an ice-skating rink, the H20 Zone kids aquapark, and the Royal Promenade, an interior boulevard that stretches nearly the length of the ship and flanked by restaurants, lounges and boutiques, among many others. Also from Fort Lauderdale, Independence of the Seas will alternate seven-night Eastern and Western Caribbean vacations for its very first summer Caribbean season in 2015. 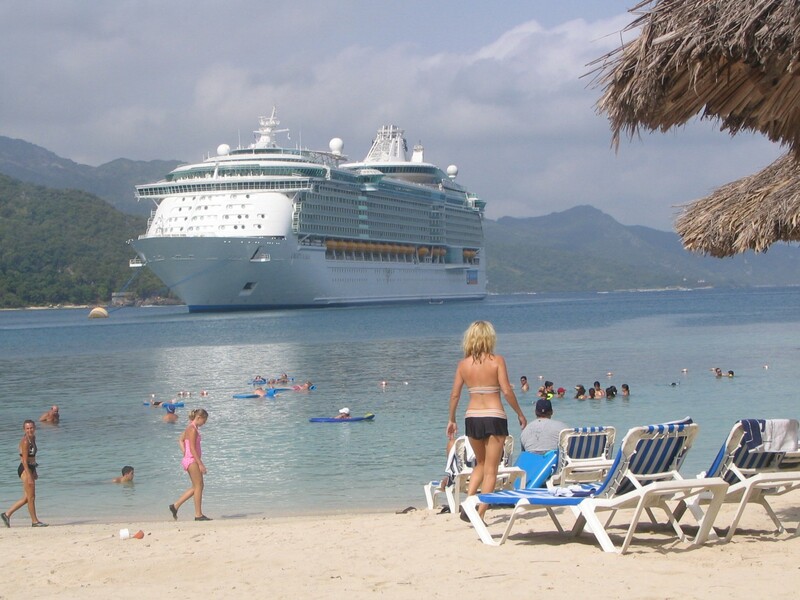 Western Caribbean ports of call include Falmouth, Grand Cayman, Cozumel and Labadee, while San Juan, Puerto Rico; St. Maarten; and St. Kitts are on the Eastern Caribbean itinerary. 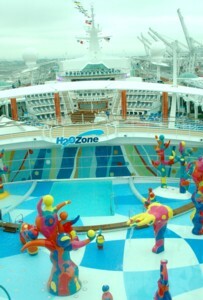 Independence of the Seas is among the Freedom class of ships, which first introduced the FlowRider surf simulator and cantilevered whirlpools, and features other Royal Caribbean first-at-sea amenities, including the H2O Zone kids’ aquapark, the Royal Promenade, and the four bedroom, four bathroom Presidential Family Suite, which can accommodate up to 14 guests. Freedom of the Seas, the first among the Freedom class, will alternate seven-night roundtrip Eastern and Western Caribbean sailings from Port Canaveral along Florida’s space coast, calling at St. Thomas, St. Maarten and CocoCay on the Eastern Caribbean itinerary, and Falmouth, Grand Cayman, Cozumel and Labadee, Royal Caribbean’s private beach destination, on the Western Caribbean sailing. Freedom of the Seas and Oasis of the Seas’ guests enjoy the DreamWorks Experience, an exclusive integrated entertainment program developed with the world-class animated film studio powerhouse DreamWorks Animation. The DreamWorks Experience was first launched aboard Allure of the Seas in November 2010 and continues to impress guests and receive accolades. Guest can join in parades, themed activities and themed events based on DreamWorks Animation’s popular feature-film characters, including Po of “Kung Fu Panda;” Shrek, Fiona and Puss In Boots of “Shrek;” and Alex the Lion, Gloria, and the Penguins from “Madagascar.” Oasis of the Seas and Freedom of the Seas also is equipped with a 3-D movie theater playing the latest DreamWorks Animation films, as well as a dedicated RCTV channel, featuring a variety of the film studio’s popular movies. For its part, Grandeur of the Seas will continue round-trip sailings from historic Baltimore, Md., and sail round-trip, seven-night Bahamas and Bermuda cruises. Guests will call at Port Canaveral, Nassau and CocoCay, Royal Caribbean’s private Bahamian island paradise. On Grandeur of the Seas’ Bermuda sailings, guests will enjoy three days at Kings Wharf to explore all the charm of Bermuda. In the autumn season, the ship will alternate six-night Bermuda sailings and eight- and nine-night Canada and New England cruises, calling at Portland and Bar Harbor, Maine; and St. John, New Brunswick, and Halifax, Nova Scotia, in Canada. In the autumn months of 2015, Brilliance of the Seas also will offer vacationers seven- and nine-night round-trip Canada and New England fall foliage sailings from Boston, Mass., while Serenade of the Seas will sail between Quebec City, Quebec, and Cape Liberty Cruise Port in Bayonne, N.J., on 10- to 14-night fall foliage itineraries. Both Radiance-class ships, Brilliance of the Seas and Serenade of the Seas feature Royal Caribbean onboard innovations, such as the adults-only Solarium pool area, self-leveling pool tables, and sea-facing glass elevators for breathtaking vistas of the unfolding shoreside landscape, known for its display of vibrant colors in the autumn seasons. Royal Caribbean International is an award-winning global cruise brand with a 40-year legacy of innovation and introducing industry firsts never-before-seen at sea. The cruise line features an expansive and unmatched array of features and amenities found only on Royal Caribbean including, jaw-dropping, Broadway-style entertainment and industry-acclaimed programming that appeals to families and adventurous vacationers alike. Owned by Royal Caribbean Cruises Ltd. (NYSE/OSE: RCL), the cruise line sails 21 of the world’s most innovative cruise ships to the most popular destinations in the Caribbean, Europe, Alaska, South America, the Far East, and Australia and New Zealand. World renowned for its friendly and engaging Gold Anchor Service, delivered by every staff and crew member, Royal Caribbean has been voted “Best Cruise Line Overall” for 10 consecutive years in the Travel Weekly Reader’s Choice Awards. For additional information or to make reservations, call your travel agent; visit RoyalCaribbean.com; or call -800-ROYAL-CARIBBEAN. Follow on Facebook at Facebook.com/RoyalCaribbean or on Twitter @RoyalCaribbean. During National Cruise Vacation Week, Oct. 20-25, 2013, Royal Caribbean International cruiseline is offering vacationers up to $100 onboard credit on any seven-night Caribbean cruise during summer 2014. From October 20 through 25, 2013, you can receive $50 onboard spending credit per interior or ocean view stateroom (Option Code SPO1) or $100 onboard credit per balcony or suite-category stateroom (Option Code SPO2) when you make a new individual booking on a seven-night Caribbean itinerary, sailing from June 1 through August 31, 2014. The National Cruise Vacation Week offer is applicable only on new individual bookings and the option code must be registered at the time of booking. Details about Royal Caribbean’s National Cruise Vacation Week offer are available during the week of October 14 at http://www.RoyalCaribbean.com/VacationWeek. Cruisegoers have a choice of five acclaimed cruise ships, including Oasis of the Seas and Allure of the Seas – sister-ships that share the title of the world’s largest and most innovative cruise ships – Freedom of the Seas, Navigator of the Seas and Jewel of the Seas. Each ship delivers a collection of exclusive Royal Caribbean onboard amenities to make for an unforgettable vacation. Oasis of the Seas and Allure of the Seas feature seven themed neighborhoods that offer the industry’s widest array of innovative onboard amenities. Guests can relax in Central Park, a lush outdoor space with more than 12,000 living plants and trees; the Boardwalk, a festive space featuring the only handcrafted carousels at sea and the first-and-only AquaTheaters for high-diving performances and fountain shows synchronized to music and lights; the Pool and Sports Zone, with twin FlowRider surf simulators, five different pools, and the only zip lines at sea; professional ice-skating productions and Tony Award-winning Broadway musicals ‘Hairspray’ and ‘Chicago: The Musical’ in Entertainment Place; the levitating Rising Tide Bar in the Royal Promenade; the Vitality at Sea Spa and Fitness Center for rejuvenating treatments and classes; and the cruise line’s award-winning Adventure Ocean kids and teen program in the Youth Zone. Guests also enjoy up to 26 dining options and have an expansive selection of boutiques, lounges and bars to explore. Freedom of the Seas first introduced an onboard FlowRider surf simulator and also now features some of the most popular amenities that debuted on the Oasis class of ships, such as a 3-D movie theater, an oversized LCD movie screen poolside, the Cupcake Cupboard, as well as bow-to-stern Wi-Fi service and interactive digital signage. The ship’s Adventure Ocean program has been expanded with the Royal Babies and Tots Nursery for six- to 36-month olds, and the ImagineOcean! glow-in-the-dark puppet show for kids. Navigator of the Seas will undergo extensive revitalization in spring 2014, and will re-emerge from drydock to feature a new FlowRider surf simulator, as well as debut the Quantum-class Virtual Balcony in select interior staterooms – a new amenity that also will be aboard the highly anticipated Quantum of the Seas, which will launch in late 2014. Jewel of the Seas’ guests can sharpen their billiards skills on the ship’s self-leveling pool tables as they visit charming ports in the Southern Caribbean. Royal Caribbean International is an award-winning global cruise brand with a 40-year legacy of innovation and introducing industry “firsts” never before seen at sea. 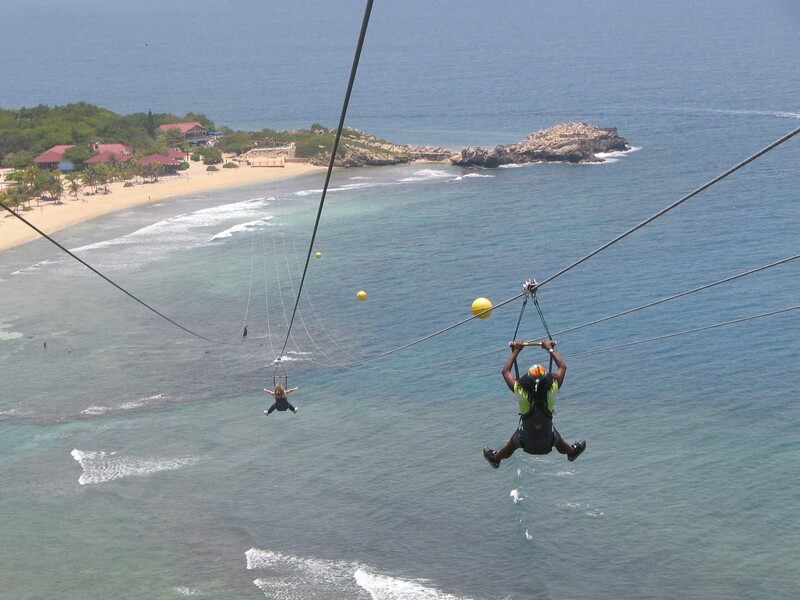 The cruise line features an expansive array of amenities including, jaw-dropping, Broadway-style entertainment and industry-acclaimed programming that appeals to families and adventurous vacationers alike. For additional information or to make reservations, call your travel agent; visit RoyalCaribbean.com; or call (800) ROYAL-CARIBBEAN. 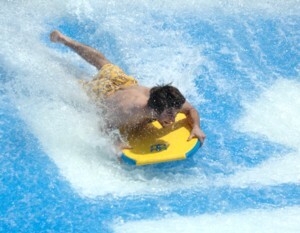 Follow us on Facebook at Facebook.com/RoyalCaribbean or on Twitter @RoyalCaribbean. This winter, Royal Caribbean International is inviting families to start a new tradition and spending the holidays at sea, with special deals and festivities from Thanksgiving through New Year’s. After all, “Why Not?” as the line’s slogan goes. To kick off the holiday season, Royal Caribbean is pulling out all the stops for guests to enjoy a bountiful and memorable Thanksgiving. Not only will the chefs in the cruise line’s main dining room feature a gourmet turkey dinner (and take care of the grocery shopping, cooking and dishes too), but the award-winning Adventure Ocean program will provide kids with themed activities including Thanksgiving story time and arts and crafts. What better way to alleviate the stress that typically comes along with the holiday season than indulging in the Royal treatment? Guests this winter can enjoy a wide range of exclusive and innovative onboard amenities, entertainment, and award-winning family programming, while observing the season’s traditional festivities. Most travelers won’t even have to wander much further than their own backyards to find a holiday cruise vacation to suit their interests. Royal Caribbean’s fleet offers a diverse number of holiday itineraries departing from nine easy-to-reach domestic home ports, including Bayonne, NJ, Baltimore, MD, Port Everglades (Fort Lauderdale), Miami, Port Canaveral, and Tampa, Fla., Galveston, TX, Los Angeles, Calif. and San Juan, Puerto Rico. A seven-night Eastern Caribbean Thanksgiving sailing is available aboard Freedom of the Seas, departing November 21, 2010, from Port Canaveral, Fla.. Freedom of the Seas offers innovative onboard amenities and entertainment options, such as the FlowRider surf simulator, an ice-skating rink, rock-climbing wall, and street parties and parades in the Royal Promenade, a boulevard that runs nearly the length of the ship, lined with boutiques where guests can get a head start on their holiday shopping. Royal Caribbean will deck its ships with seasonal decorations to embrace the holiday spirit at sea throughout the month of December. Royal Caribbean offers Hanukkah-themed festivities lasting all eight days of the holiday, including a Rabbi aboard every ship to conduct a nightly menorah lighting ceremony and services. For those celebrating Christmas, a Catholic priest also will be aboard to lead the holiday’s observances including a midnight mass on Christmas Eve. Other Christmas festivities sure to get families bonding and into the spirit include: classic movie screenings, guest and crew caroling, cookie decorating, special Christmas-themed Adventure Ocean programming, and holiday ice skating aboard select ships. Families may still book staterooms aboard the new Allure of the Seas for the seven-night roundtrip Western Caribbean Holiday itinerary departing from Port Everglades in Ft. Lauderdale, Fla. sailing on December 18, 2010. Ring in the New Year at sea with the Cruise Director and Captain’s Countdown and themed parties in every onboard lounge. Young cruisers will enjoy the extended late night party zone where kids and teens will be celebrating at their own New Year’s festivities. West Coast vacationers can celebrate the New Year aboard Mariner of the Seas’ December 26, 2010, sailing on a seven-night Mexican Riviera itinerary from Los Angeles, Calif. Mariner of the Seas is the largest and most revolutionary ship to ever sail from the west coast. Royal Caribbean International is a global cruise brand with 21 ships currently in service and one under construction. The line also offers unique cruisetour land packages in Alaska, Dubai, Europe, Australia and New Zealand, and South America. For additional information or to make reservations, call your travel agent, visit www.royalcaribbean.com or call 800-ROYAL-CARIBBEAN.